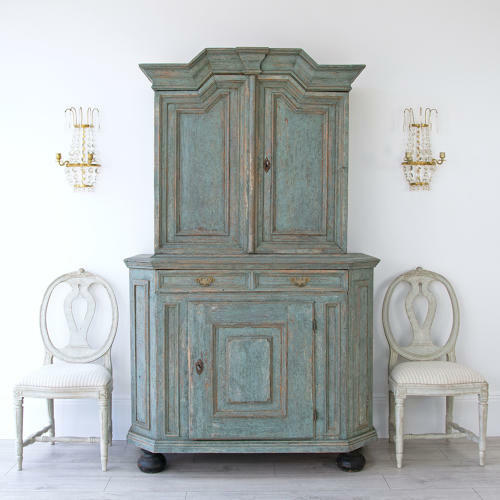 A very fine 18th century Baroque two-part cabinet with an exceptional blue patina. Featuring a top cabinet with decorative shaped overhanging pediment cornice & shaped inset panelled doors, over a bottom cabinet comprising of a single wide twin panelled drawer, over a pair of inset panelled cupboard doors, with beautiful canted inset panelled corners, and standing on original bun feet. Inside the cupboard had been dry-scraped back to traces of its original colour. Swedish circa 1770.